In the bustling Canada Water theatre, Inpress Books hosted its annual Festival of Publishing dedicated to independent presses within the UK. Since 2002, Inpress has been an important champion of independent publishing, providing vital support, services and selling their books worldwide. 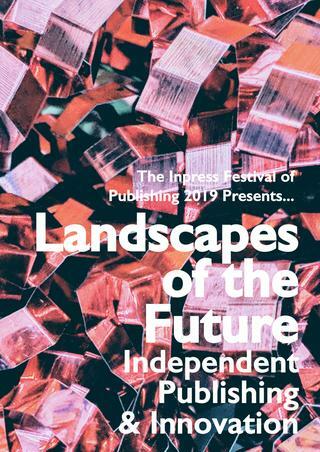 At present, Inpress represents 55 UK-based publishers, 70% of which saw their sales increase in 2018. Increasingly, independent publishers are becoming the preferred option for those looking to produce innovative and diverse books, and hence the festival’s tagline: ‘Independent is the New Mainstream’. This positive, forward-looking view of indies’ position within the publishing ‘ecosystem’ – a term I found useful when talking about the industry – was reflected in the topics and discussions throughout the day. This year’s festival was titled ‘Landscapes of the Future’ and it tackled questions of authenticity, voice and how to sustain a thriving industry for future generations. While the festival was intended for publishers working within the industry, the day was filled with interesting panels and presentations with invaluable insight for those like myself looking to learn more. The list of programmes for the day covered a broad range of topics including marketing, copywriting, networks within the industry, crowdfunding, audiobooks and more. The main panels and presentations took place in the theatre’s small but intimate auditorium and this made the conversations feel less formal. As varied as the topics were, so were the panellists, presenters and attendees with various backgrounds and expertise. Offering his keynote speech was Dan Kieran of Unbound Books, a company who has made its mark in the industry with their crowdfunding platform. In his speech, Kieran touched on some of the themes that would resurface later: getting to know who your audience and closer to readers and using data to do so. Kieran’s opening presentation led seamlessly into the first panel discussion of the day on Post-GDPR Marketing and ‘getting to know your audience all over again’. This panel was the perfect of example of the range and diversity of publishing and the how dynamic the literary field is. The panellist were individuals who played different roles in the field, from reviewers, literary podcast, indie publishers and those championing these activities through marketing. The idea of a publishing ‘ecosystem’ quickly came into view as various specialists showed how they might work together to push independent publishers to the forefront of the industry. There was very much a feeling of camaraderie and support not only among the various professionals but towards myself and my fellow student, Michele Gallacher, who were there to learn. What struck me most about the day was the welcoming attitude and willingness to share information and resources. Stand-out presentations included a masterclass on copywriting by Alex Young who has over 25 years of experience in both in-house and as a freelancer. Young’s masterclass was entertaining and informative. Beginning with a seemingly unrelated link to Ed Sheeran, she broke down what copywriters can learn from the pop star. Young spoke about the importance of knowing your audience, establishing your voice, learning how to speak to the audience and telling your story. This crash-course came with plenty of practical tips, but given the confines of the presentation time, not everything could be covered, of course. This presentation prompted further discussion and enquiry during the lunch break and shed light on further resources. Prior to the event, I was fortunate enough to organise further in-depth interviews with publishers. Along with speaking at their panels, Alexa von Hirschberg (Senior Commissioning Editor at Bloomsbury) and Nathan Connelly (Director of Dead Ink Books) kindly agreed to interviews once their formal proceedings were over. These opportunities provided me first-hand accounts on the inner workings of a publishing house, their experiences there and how they perform their respective roles. The exclusive access to both publishers from different-sized houses provided an interesting comparison in how they operate. As is the nature of events like this, the key opportunities lie in the lunch and coffee breaks which present opportunities to network, to get to know the industry professionals and for them to get to know you. This was the most enjoyable part of the day and also one filled with an abundance of learning. To someone like myself who is new to this world, publishing seems, given the gravitational pull towards London especially, like a vast, lonesome and intimidating field but it was made to feel less more welcoming and easier to navigate, not only by those willing to offer advice and support, but also the projects and scheme available to those entering the ‘ecosystem’. ‘Ecosystem’ is an apt way of think about independent publishing since it is, from my observations, a system which looks to not only to self-sustain but to open itself to new talent, voices and perspectives and thus grow. A large part of this seems to take the form of adapting and reinventing the book through digital means. A number of presentations were focussed on using digital platforms to push their books, whether they be ebooks, audiobooks, podcasts, blogs or crowdfunding. The digital space is also where, unsurprisingly, connections and networks are maintained. Twitter more than any other social media appear to be the best way of accessing this system, at least virtually,. In the absence of a personal site or blog, people would exchange Twitter handles or at the very least email addresses. Activities undertaken by independent publishing are many and varied and, arguably, there is more room for innovation, risk taking and exploration. It is easy to see why independent is appealing to more and more writers, especially those whose voices and stories are not being heard. As the tagline states, independent is becoming the new mainstream. As a newcomer to this world, the experience has certainly filled me with enthusiasm and hope; enthusiasm for the opportunities and possibilities that lie ahead, and hope that an industry that seemed initially inaccessible (and frankly exclusive) seems to have its door ajar. I would urge anyone who, like me, who might consider entering publishing, to immerse themselves in an event like the one hosted by Inpress. To be a fly-on-the-wall is useful; to ask be able to questions is even better. The first-look experience into indie publishing was positive and encouraging. From content to delivery, Inpress exceeded my own expectations and put to rest some of the anxieties I had prior to the event.